And that's why when the US economy catches a cold, the rest of the world catches economic cancer. These are nominal GDP data, and they are highly misleading. For example, if ppp data are used, Russia’s GDP is about 10% larger than Germany’s. Comparing what the two economies actually produce, the ppp data are more reliable. I don’t have the data for China and the US at hand, but I wouuld not be surprised if China’s is as large in ppp. 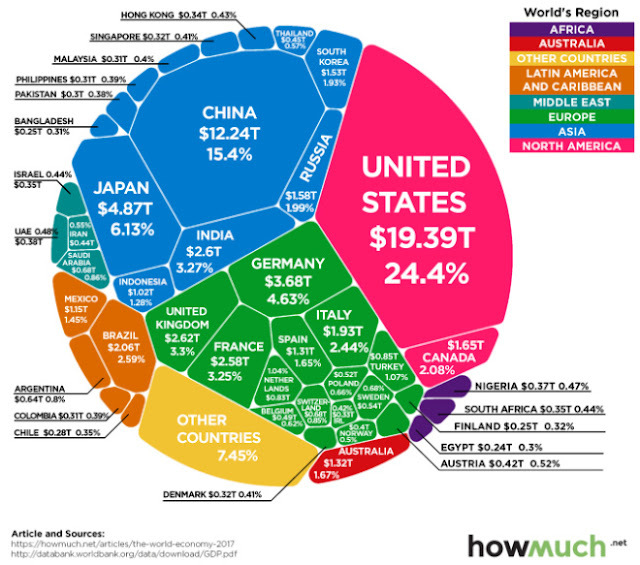 Interesting that basically, the economy is divided into thirds between the U.S., Europe and the Orient. The colonizers were eager to seek the wealth that lay in Africa. I can see the ones that went for the coaling stations for the fleet but for the rest? A continent built on diamonds and gold produces almost nothing. It's a staggering graph and I was going to put it up at the fount of knowledge.